The 3D View is where you see the real-time updates of the changes you make to your terrain. When you move the camera, link a node, or change a node parameter, the results are seen immediately in the 3D View. Moving the camera: Pan, zoom, rotate the terrain, and view the entire terrain. Toggling the wireframe display: Display the wireframe of the terrain or mask as an overlay. 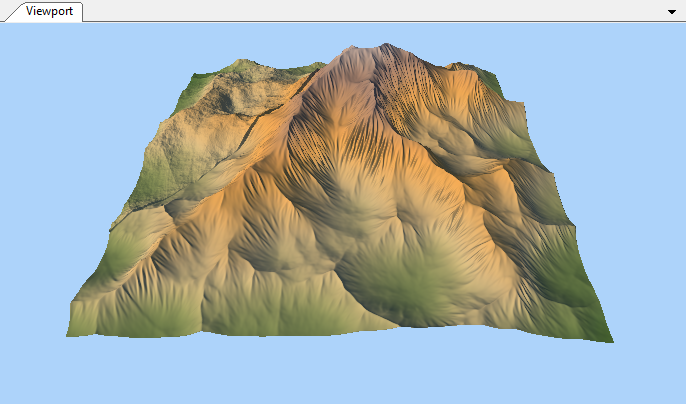 Viewing the terrain as a mask: View the terrain as a mask without modifying the terrain. Freezing the display: Keep the terrain or mask currently displayed visible in the 3D View regardless of the selected node. Choosing default terrain colors: Choose from three default terrain colors. Setting the light. Adjust the sun's light and the ambient light on a terrain. See also the Nodes reference guide for details on the real-time update of changes to the node parameters.